How do filopodia pull on a substrate? Although a reterograde motion of actin filaments is intrinsic in the formation of filopodia, the forces generated by actin treadmilling are too weak to facilitate the “pulling” mechanism required for rigidity sensing and other mechanosensing processes. This characteristic of filopodia is instead produced by the activity of myosin motor proteins such as Myosin II . This process, as described in the Functional Module: ‘Microfilament Motor Activity’, is similar to that observed in the actin filament networks of the lamellipodia and lamella. Disassembly of actin bundles at the filopodial tip combined with the tension of the lipid bilayer also theoretically support the forces needed for pulling . After a filopodium binds to an object, retrograde actin movement and myosin motor activity provide the force(s) needed for pulling the object towards the cell body. 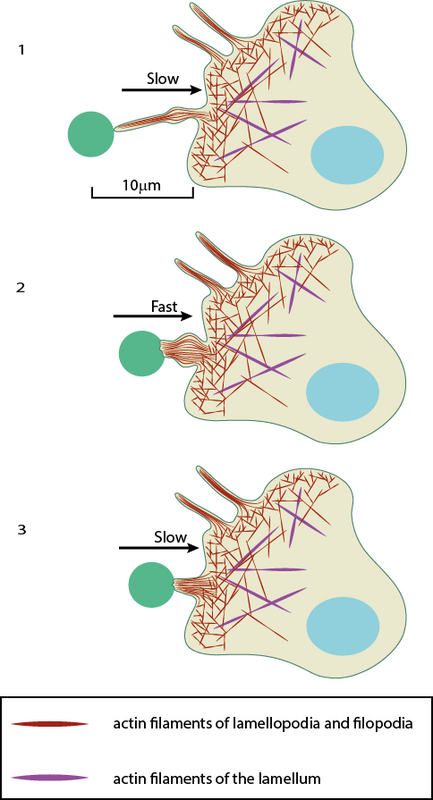 Once pulling starts, the initial slow movement (#1) is followed by a burst of rapid movement (#2) that diminishes as the object reaches the cell body (#3) . Filopodia pulling is important in a number of processes additional to mechanosensing. One example is in the immunological response to pathogens where immune cells such as macrophages will pull a pathogen toward the cell body for active uptake and processing . In another example the filopodia of mature osteoclasts bind to extracellular substrates at their tips and transport the particles rearward by retraction for resorption to the cell body, leaving the cell body adhered to the substrate . It has also been shown that matrix coated beads are pulled rearward by an active process rather than by diffusion after the beads bind to integrins . In each case the mechanism behind pulling remains the same. While the powerstroke of Myosin II essentially drives the movement of filaments, the pulling process occurs over three distinct stages, each defined by varying rates of retraction. These can be described using the process by which pathogens are pulled towards macrophage cell bodies as an example. Here, immediately following filopodial adhesion to a pathogen, a slow motion retraction of the filopodia commences. This is followed by a phase of rapid movement where the pathogen is pulled towards the cell. 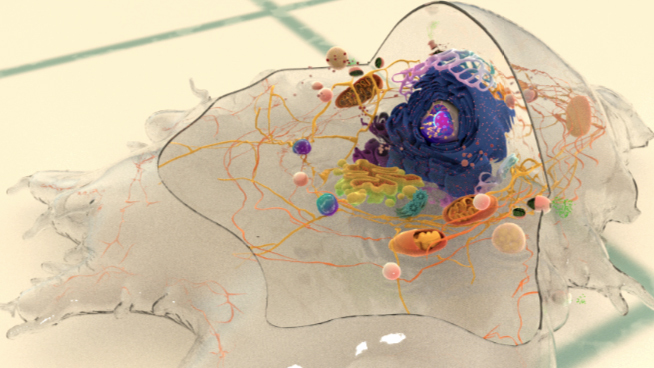 A final phase of slow retraction occurs, resulting in the pathogen being fixed to the cell surface. This final phase of retraction is also characterized by a thickening of the filopodial base which is necessary to build-up large retraction forces for internalization . Filopodial attachment to a surface (in addition to the ligand) produces counteracting adhesion forces which influence the retraction speed. In general, the rearward movement or ‘step size’ of a retracting filopodia decreases as the filopodia encounters a greater counteracting force . Importantly, the mechanism may also be hijacked by a pathogen to ensure an efficient infection. This has been described for the Murine Leukemia Virus, amongst others . In this case the virus binds to surface receptors at the tips of the filopodia and essentially rides the retracting actin filaments to entry points in the cell where it is internalized. What are higher order actin structures? What is the first step in filopodium formation? How does cross-linking of actin filaments aid in their extension? How quickly can filopodia extend? How do filopodia attach to the surrounding substrate? Why do filopodia move laterally? What causes filopodia retraction and collapse?